Grapefruit seed extract (GSE), or citrus seed extract, is made of the pulp, seeds, and white membranes of grapefruit (Citrus paradisi), which comes from the grapefruit tree. It’s used for everything from fighting infections to treating skin conditions. How do you make grapefruit seed extract? Grapefruit seeds and pulps are mixed into a highly acidic liquid. After further processing, the mixture will turn into a thick, yellow liquid with a strong, bitter taste. Vegetable glycerin is then added to lower acidity and bitterness. The main bioactive compounds in GSE include the polyphenols naringenin and limonoids. As a result, grapefruit extract liquid supplements may have many incredible health benefits. GSE is used for its antifungal, antiviral, antioxidant, anti-cancer, anti-inflammatory, and wound-healing properties. Grapefruit seed extract could also potentially boost the immune system, fight skin conditions, and more. In this article, we will continue to explore grapefruit seed extract benefits. Read on to learn how to use GSE, as well as important information about grapefruit seed extract side effects. In the early 1970s, Dr. Jacob Harich first documented the medical benefits of grapefruit seed extract, particularly how it could protect poultry and fish from various bacteria, fungi, and parasites. GSE is now typically combined with vegetable glycerin and used in antiseptic, antibacterial, antifungal, antiparasitic, and antiviral products. In a 1990 study published in the Journal of Molecular Medicine, researchers discovered that grapefruit seed extract performed in a similar fashion (or even better) than 18 fungicides and 30 antibiotics, but without the side effects of antibiotics. 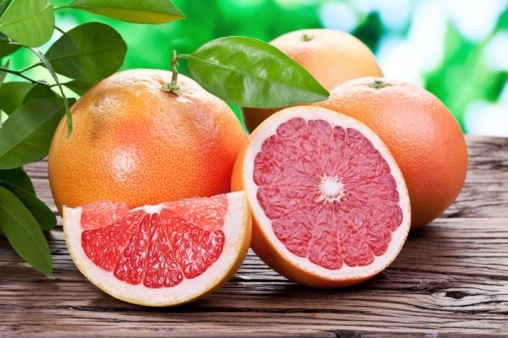 Grapefruit seed extract has the potential to kill viruses and fungi. Various studies have revealed that grapefruit extract can kill over 800 types of bacteria and viruses, including salmonella, E. coli, herpes, parasites, and fungi. One Polish study from 2001 found that grapefruit extract had a particularly potent effect against the fungal infection known as candida. Grapefruit seed extract’s antifungal properties work against Candida albicans strains by killing yeast cells that have overgrown in the body. Grapefruit seed extract is also used for other fungal infections such as histoplasmosis, yeast infections, athlete’s foot, and toenail fungus. Grapefruit seed extract has anti-cancer properties, because it contains antioxidants, sterols, tocopherols, citric acid, limonoids, and other minerals. In a 2006 study, researchers from the University of Colorado discovered that colon cancer cells treated with GSE had a higher chance of dying, compared to the cells not treated with grapefruit seed extract. Consuming grapefruit seed extract can help heal wounds and scar tissue at a quicker rate. According to a study published in the journal Free Radical Biology and Medicine, grapefruit extract accelerated wound healing and minimized scarring by encouraging the body to produce more of the compound that regenerates blood vessels that have been damaged, while also increasing the number of free radicals that help clear bacteria. Grapefruit seed extract also has antioxidant properties responsible for protecting the heart muscle from damage due to oxidative stress. A study published in the International Journal of Cancer Research in 2009 found that animals treated with grapefruit seed extract had significantly less heart muscle damage than those not receiving GSE. Some of the animals were treated with GSE before receiving an anti-cancer drug called doxorubicin, known for its cardiotoxic side effects. Other animals in the study had taken GSE after being given doxorubicin. The flavonoid naringenin in grapefruit seed extract is also known for its protective antioxidant effects against cardiometabolic disorders. It specifically has a protective effect against myocardial cells, and has also been shown to help reduce cholesterol in rats. Other research shows that naringenin has a positive effect against the progression of abnormal enlargement of the heart muscle (cardiac hypertrophy) induced by pressure overload. A study published in the journal Frontiers in Pharmacology in 2017 found that naringenin produces cardioprotective effects in the hearts of one-year-old rats through the activation of mitochondrial large-conductance calcium-activated potassium channels. Also, consuming GSE could help reduce the risk of developing a coronary heart disease (for high-risk patients) due to its high levels of pectin. GSE may help treat acne. After you cleanse your face, add two to three drops of GSE to your fingertips and massage your face in a circular motion for one minute. After you rinse your face, you might feel a tingling sensation, but that’s just the bacteria-killing properties doing their job. Studies have shown that HIV-positive people can improve their immune systems by consuming GSE. According to a 2002 study published in the journal Biological Research, GSE can lower the amount of certain HIV receptors and cause a cellular decrease in the number of co-receptors, meaning GSE may effectively reduce the impact of HIV. In a study published in the World Journal of Gastroenterology in 2005, researchers discovered that the high amounts of flavonoids in grapefruit seed extract can help activate the gastric defense mechanism, which has been able to protect animals from laboratory-induced gastric injury. Some of the animals were pretreated with GSE, while others were not. The animals were then induced with stress that led to gastric damage. The animals pretreated with GSE sustained significantly fewer gastric lesions than those not pretreated. Consuming grapefruit seed extract can also help heal stomach ulcers. Dissolve one GSE capsule into juice or water and consume with food. If you don’t feel irritation in the stomach, start taking two a day and then eventually increase to three capsules a day. Researchers have found resistance rates above 25% to 50% to antibiotics often used to treat urinary tract infections (UTIs). Most UTIs are caused by E. coli (Escherichia coli) bacteria that can live around the urinary tract, bowels, and vaginal cavities. Symptoms include urinating difficulty, abdominal pain, and pelvic pain in women. One study published in the Journal of Alternative and Complementary Medicine in 2005 found that grapefruit seeds effectively killed antibiotic-resistant UTIs. Patients were given five to six grapefruit seeds every eight hours for two weeks. Eczema is a skin condition that produces symptoms like redness, inflammation, scaling, dryness, itchiness, and blisters. This skin problem is often caused by food allergies or sensitivities and poor digestion overall. In one study published in the Journal of Orthomolecular Medicine in 1990, researchers examined the effectiveness of grapefruit seed extract on atopic eczema patients who also had intestinal dysbiosis—also called microbial imbalance of the digestive tract. All patients had bleeding lesions over their limbs, trunk, and face, while some of them also had intermittent diarrhea, gas, constipation, abdominal discomfort, and bloating. The participants were given either 150 mg of encapsulated grapefruit seed extract three times daily or two drops of 0.5% liquid grapefruit seed extract concentrate twice daily. After a month, those taking the GSE capsules had experienced significant improvements in gas, constipation, and abdominal discomfort symptoms. Also, 20% of those taking the liquid GSE had significantly improved digestive symptoms. Pancreatitis is an inflammation of the pancreas—a small organ near the upper abdomen, in front of the spine and behind the stomach. Acute pancreatitis comes on suddenly and may last just a few days. Chronic pancreatitis, on the other hand, is thought to be incurable, and symptoms are often worsened by drinking alcohol or consuming a large, high-fat meal. One study published in the Journal of Physiology and Pharmacology in 2004 found that laboratory rats treated with grapefruit seed extract suffered significantly less pancreatic damage from ischemia and reperfusion than those that hadn’t received grapefruit seed extract. The positive effect of GSE was due to the flavonoid naringenin. Streptococcus mutans is a bacterium naturally found in the mouth of humans; however, it is also the top cause of tooth decay. Grapefruit seed extract may help inhibit the growth and acid production of this strain of strep. A study published in the journal Acta Academiae Medicinae Militaris Tertiae in 2011 found that low concentrations of GSE were not only effective against the S. mutans bacterium, but they also exhibited additional antibacterial activity as well. What are other grapefruit seed extract benefits? The following are some additional grapefruit seed extract benefits and uses to keep in mind. Rather than use chlorine, add GSE as a germicide to swimming pools and your bath water to help keep your skin clean and healthy. For those with diarrhea or dysentery due to food poisoning or another illness, use one drop of GSE with an ounce of filtered water. If your dog has fleas, put one or two drops of GSE into your dog’s food twice a day. This is also a great way to help prevent your pet from getting fleas and other infections. Spray GSE onto your plants to prevent bugs from eating them—it’s a non-toxic disinfectant. Add 10 to 15 drops of GSE to the final rinse in your laundry to kill bacteria and fungi. Add a few drops of GSE to carpet cleaners for killing pathogenic bacteria. Consume GSE between meals; if the extract irritates your stomach, then consume with your meals. Try incorporating GSE into your diet for approximately one month. Day 1 to 3: Take 10 drops of GSE twice daily. Alternatively, take one 125 mg capsule twice daily. Day 4 to 10: Increase the dosage to 15 drops twice daily or one capsule three times daily. Day 11 to 28: Increase the dosage to 15 drops three times daily or three capsules three times daily. The recommended dosages depend on a number of factors, including an individual’s weight. I recommend speaking with your doctor first before introducing any new supplements into your diet. Your doctor can also help you figure out what the correct dosage would be for your body. Although there are many benefits, there are also grapefruit seed extract side effects to consider. For instance, never put grapefruit seed extract into your eyes, and avoid using GSE at full strength in your ears, nose, mouth, or other sensitive areas of the body. When used at full strength on the skin, it can lead to irritation. See a doctor immediately if you notice any signs of a severe allergic reaction after using grapefruit seed extract. Allergic reaction symptoms include tingling or swelling in your throat or mouth, trouble breathing, chest tightness, rash, hives, or swelling in your hands or face. Some commercial GSE products contain benzethonium chloride and preservatives like methylparaben and triclosan. These may affect the effectiveness of GSE and cause allergic reactions. Other reports suggest that grapefruit seed extract significantly increases levels of the drug warfarin (“Coumadin”) in the body, which will increase the risk of bleeding. It is also a good idea to consult your doctor before using GSE if you are breastfeeding, pregnant, or plan to become pregnant while using GSE. Moreover, be sure to tell your doctor before taking GSE if you are allergic to any medicine, are currently taking medications such as blood thinners or medicines used after an organ transplant, or have any other health issue like hypertension or a blood vessel or heart problem. Grapefruit seed extract side effects are not common when taken as directed. That being said, other possible adverse effects include a swollen or painful tongue; vomiting; nausea; and burns of the throat, mouth, or stomach. Stop using GSE if you experience any negative effects. Where can you find grapefruit seed extract? It is available as a supplement in tablet, capsule, or liquid concentrate form, and can be purchased online or at a health food store. Always avoid grapefruit seed extract brands with synthetic chemicals like triclosan, methylparaben, or benzethonium. Look for GSE formulas with only grapefruit seed extract and vegetable glycerin. What is the best dosage of grapefruit seed extract? Follow the instructions on the GSE label or consult your health care provider about the proper dosage. In general, the recommended dosage for grapefruit seed liquid extract is 10 to 12 drops. Take it in at least five ounces of filtered water one to three times daily. For tablets and capsules with dried GSE, the general recommendation is 100 mg to 200 mg one to three times per day. The dosage will depend on why you are taking GSE and the strength of the supplement. Grapefruit seed extract can reduce the amount of good bacteria in the gut when taken for long periods of time. When taking GSE for three or more days in a row, consume a probiotic supplement a few hours before taking GSE. Also, when storing GSE, make sure it is kept away from direct light and heat, or it may negatively affect the supplement. Grapefruit seed extract is a popular supplement derived from the seeds and pulp of grapefruit. GSE is often praised for its anti-cancer, anti-inflammatory, antioxidant, antiviral, antifungal, and wound-healing properties. As a result, grapefruit seed extract may also benefit heart health, kill antibiotic-resistant UTIs, fight candida and fungal infections, treat stomach ulcers and digestive issues associated with eczema, boost immunity, fight tooth decay, and protect against pancreatitis. When it comes to grapefruit seed extract, quality matters. Look for GSE with grapefruit seed extract and vegetable glycerin, and free of synthetic harmful ingredients such as triclosan, methylparaben, and benzethonium. Consult your doctor for the proper dosage. They will also be able to tell you if GSE is the right fit for you. Jankoski, T., “Benefits of Grapefruit seed Extract,” Applied Health web site; http://appliedhealth.com/benefits-of-grapefruit-seed-extract/, last accessed June 8, 2015. Hitti, M. “Grape Seed Extract vs. Colon Cancer,” WebMD web site, October 19, 2006; http://www.webmd.com/colorectal-cancer/news/20061019/grape-seed-extract-vs-colon-cancer. Krajewska-Kulak, E., et al., “[Effects of 33% grapefruit extract on the growth of the yeast—like fungu, dermatopytes and moulds],” Wiadomości Parazytologiczne, 2001; 47(4): 845-849, PMID: 16886437. Da Pozzo, E., et al., “The Citrus Flavonone Naringenin Protects Myocardial Cells against Age-Associated Damage,” Oxidative Medicine and Cellular Longevity, 2017, article ID 9536148, doi: 10.1155/2017/9536148. Zhang, N., et al., “Naringenin attenuates pressure overload-induced cardiac hypertrophy,” Experimental and Therapeutic Medicine, Dec. 2015; 10(6): 2206-2212, doi: 10.3892/etm.2015.2816. Testai, L., et al., “The Citrus Flavanone Naringenin Produces Cardioprotective Effects in Hearts from 1 year Old Rat through Activation of mitoBK Channels,” Frontiers in Pharmacology, Feb. 2017, 8: 71, doi: 10.3389/fphar.2017.00071. Racco, M., “Antibiotic resistant UTIs are on the rise. Here’s what you need to know,” Global News; last updated May 25, 2018, https://globalnews.ca/news/4229300/antibiotic-resistant-uti/, last accessed June 19, 2018. Oyelami, O.A., et al., “The effectiveness of grapefruit (Citrus paradisi) seeds in treating urinary tract infections,” Journal of Alternative and Complementary Medicine, Apr. 2005; 11(2): 369-371, doi: 10.1089/acm.2005.11.369. Ionescu, G., et al., “Oral Citrus Seed Extract in Atopic Eczema: In Vitro and In Vivo Studies on Intestinal Microflor,” Journal of Orthomolecular Medicine, 1990, 5(3); http://orthomolecular.org/library/jom/1990/pdf/1990-v05n03-p155.pdf. Gavura, S., “Not natural, not safe: Grapefruit Seed Extract,” Science-Based Medicine, March 10, 2016; https://sciencebasedmedicine.org/not-natural-not-safe-grapefruit-seed-extract/, last accessed June 19, 2018.